The painter and sculptor Gilbert “Magu” Lujan was featured in my “Pomona A to Z” series of columns in 2004, representing the letter M. A pioneering figure in the Chicano art movement, and in later years a resident of the Pomona Arts Colony, he died in 2011. But he’s still remembered. 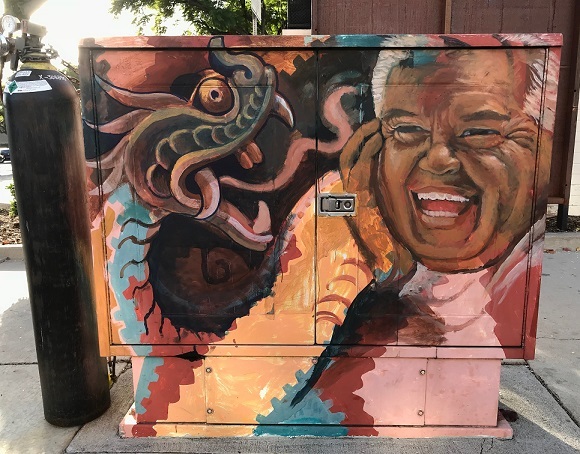 Lujan’s work was the subject of a PST: LA/LA show, and across from the dA Center for the Arts in downtown Pomona, a utility box’s mural pays homage. See above. I suspect the (Grauman’s?) dragon is a reference to his most-seen work, the Hollywood-themed decor of the Hollywood and Vine Metro station. 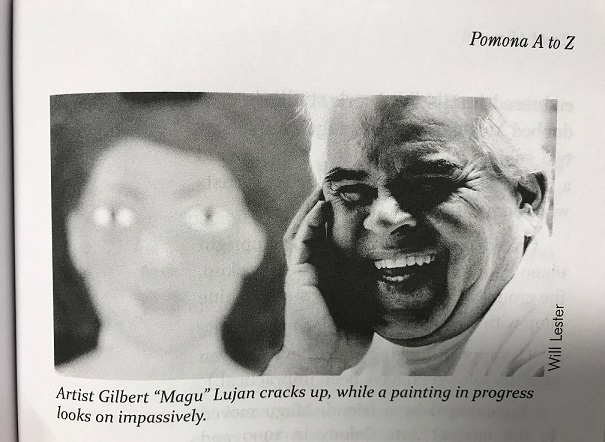 Magu’s pose is clearly based on the portrait by my colleague Will Lester for my column about him, which is included in my “Pomona A to Z” book. If the artist’s name turns up, I’ll credit him/her. Update: Antonio Mejia is the name of the painter. Thanks to Chris Toovey for the credit.